Illustrates the original nine counties established before Kentucky's admission into the Union. Sesquicentennial of Kentucky 1792 1942 Map Showing the nine Counties formed by Virginia before Kentucky was admitted to the Union June 1, 1792 with their County Seats and present Counties with dates of formation and early stations. 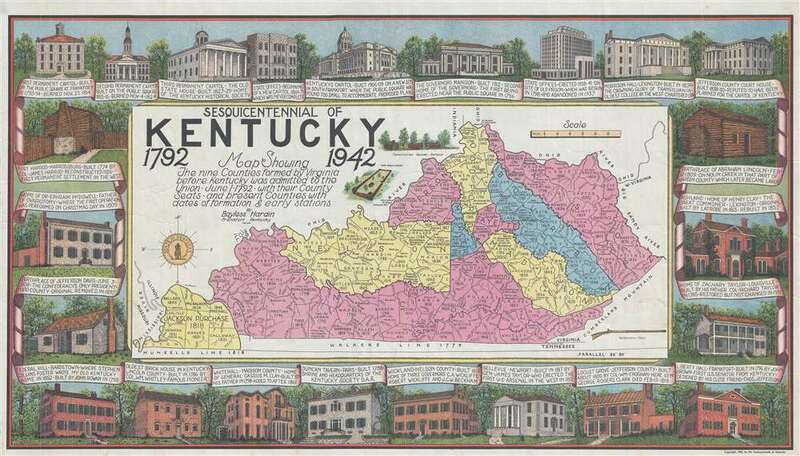 This is a 1942 Bayless Hardin map of Kentucky to celebrate the state's sesquicentennial, or the 150th anniversary of Kentucky's admission into the Union. The map depicts the state from Missouri to Virginia and West Virginia and from the Ohio River to Tennessee. An unconventional illustration of the state, the nine differently colored counties are those established by Virginia before Kentucky was admitted to the Union. Each of these nine counties is labeled, and the present counties are all illustrated and labeled as well, along with their date of formation. Numerous cities and towns are labeled throughout, including Frankfort, Louisville, and Lexington. Several rivers, streams, and creeks are labeled, as well as forts from the state's frontier days. Two vignettes are included just above the map of Kentucky, one illustrating Fort Boonesboro and the other Constitution Square in Danville. Below the map, an illustration of the 'Kentucky' rifle is included as well. An elaborate border featuring profile illustrations of historically important buildings from across the state encircles the map situated in the center. The different iterations of the capitol building are illustrated along the top, with the first two being destroyed by fire and the third now the home of the Kentucky Historical Society, where Bayless Hardin spent all of his professional life. The state capitol building now in use occupies the top center. The birthplace of President Abraham Lincoln is illustrated on the right, along with the homes of Senator Henry Clay and President Zachary Taylor. The birthplace of Jefferson Davis, a U.S. Senator and the President of the Confederate States and Fort Harrod, the first permanent settlement in the west, are illustrated along the left border. This map was produced by Bayless Hardin in February 1942 and printed by the Commonwealth of Kentucky. Bayless Evans Hardin (January 3, 1912 - April 15, 1956) was the Secretary-Treasurer for the Kentucky Historical Society from 1947 - 1956. Hardin was born near Frankfort, Kentucky and had been associated with the Kentucky Historical Society beginning in 1937 at the age of 25. He was an influential member of the Historical Society and a prolific writer. He published numerous articles in The Register, the publication of the Kentucky Historical Society, both signed and unsigned. He served as the The Register’s editor from January 1947 until his death in 1956. One of Hardin’s most influential works remained unpublished at the time of his death, a six-volume history of the city of Frankfort and Franklin County. Hardin was active in many aspects of life in Kentucky, particularly in Frankfort, and founded the Frankfort Art Club. Very good. Closed margin tear professionally repaired on verso. Light foxing. Blank on verso.